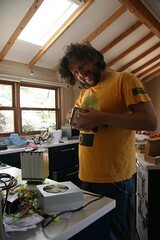 Phil is in the process of setting up his home office, which seems to consist of him spending large amounts of money on incomprehensible gadgets that subsequently have to be screwed, welded or daisy-chained together to provide computing firepower the likes of which the Blue Mountains has never seen. If anyone in the vicinity experiences any power loss over the next few days, now you know why. I'm safely hiding upstairs (wearing rubber shoes) listening to the occasional whoops of delight - signifying something working - followed by long periods of silence as TechnoBoy grapples with the next challenge sans instruction booklet. He only emerges for coffee and to babble TechnoSpeak at me, during which I nod, then back away slowly without breaking eye contact.